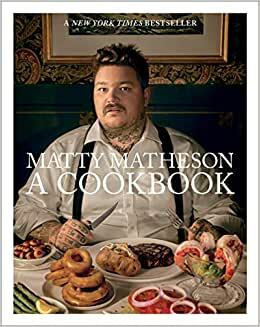 Start reading Matty Matheson: A Cookbook on your Kindle in under a minute. Born in Saint John, New Brunswick and raised in Fort Erie, Ontario, Matty Matheson is a chef and the host of Viceland’s It’s Suppertime and Dead Set on Life. This is his first cookbook. 5.0 out of 5 starsOne fantastic cookbook. I'm big fan of Matty for his cooking and personality. His shows are very entertaining. I was hoping I would be as entertained and educated with his cookbook. It exceeded my expectations and have already started planning to make a couple of his amazing recipes. Matty's book is such a good read I'm hitting it like a paperback novel. Beutifull, sad and hilarious story's and great photos that almost transport you to the places and food that made an impact on Matty's life. Cheap, thick, full of substance. Previous purchases of celebrity cookbooks have left me underwhelmed with home many actual recipes they contain. This purchase has me extremely pleased with the content. There are a few pages dedicated to biographical content, but make no mistake, this is a cookbook first and foremost. The stories and pictures make me smile as Matty shares his cooking and life adventure with you. Not your typical cookbook with all fancy dishes but some real confort food recipes as well . I am an avid cookbook collector and read them like an actual book. I am not through reading this charming cookbook yet, but wanted to hurry up and write an actual review, which I don't do very often. Upon receipt of this book you will notice how heavy and for the lack of a better word, beefy it is. Mr. Matheson has a great narrative in which he describes his life in his colorful vernacular. If you've ever seen him on Viceland, his writing is a direct reflection of him as a host as well. I'd like to compliment him on a job well done, the pages of this cookbook are thick, and the quality of the book you can feel in its pages. I LOVE the wide margins (I often take notes in my cookbooks), the photos are beautiful and enhance this book in every way possible. I have yet to try any of his recipes at this time but the read has been fun, I may come back and do a follow up a review when the time comes. 5.0 out of 5 starsMatty Matheson is a straight up OG in the kitchen! Alright, this my very first cookbook. I just received it today and I have to say I really love the quality of the book, very clean and well made. Some of them are way left feild for anything I would try...(Grilled Beef Tongue). But, there are tons of receipts that I'm going to be trying. I also like how there are little stories inside the book to really get you to connect with the chef and why he cooks the way he does. If your thinking of buying this book...BUY IT!! I mean for real it's Matty Matheson you can't go wrong!!! 5.0 out of 5 starsSome great ideas, and the best struggle meal around. Bologna Bowl is reason enough to get this cookbook! Matty is a person that just loves life and great food and likes to share them both with people he loves. This book and the recipes in it almost all relate to a story or time in his life associated with memories of his. A lot of great stories and background and can't wait to try these recipes. And for a Canadian he wrote a book with an American sized serving size, it's pretty big. 5.0 out of 5 starsMy First Cook Book! If you like watching Matty on YouTube, then you will love this book. It has everything from bologna bowls that take 60 seconds in the microwave, to exquisite seafood dinners that take all day to prepare. The short stories that Matty has behind every dish are funny yet touching, and the pictures are beautiful. I consider myself a subpar cook, but there is so much I can learn from this book with the very simple instructions that Matty provides.